Logramos publicar este sinigual Foto Libro del ABC con la ayuda y el cariño de nuestros Backers en el 2014. Años han pasado y aún recibimos solicitudes semanales para conseguir un de los 2,000 ejemplares de esta Edición Limitada. Al momento se nos agotaron las copias. Pero queremos darle a todos los niños la oportunidad de ver nuestra hermosa Isla y a su vez aprender el Abecedario en Espanol e Inglés. Descarga gratis nuestra versión en PDF del ABC de Culebra Puerto Rico - Here / Aquí - Tamaño del File: 17Mb - Alta Resolución / Lector de PDF es requerido. Si deseas puedes ayudarnos con tu donación para futuros proyectos y el mantenimiento de este portal. Gracias por el apoyo. You may Donate and help us with future projects and maintaining this website. Thanks for your Support. After a few trips to Culebra I understood how lucky my son was to be able to enjoy a place like this. At the same time, I began as any new parent does, to teach him to speak using everything around us. So I thought, with all the pictures I've had taken over the years, wouldn't it be great to do a children's alphabet book made with letters of all the beautiful things we see in Culebra? The idea, inspired by my son, was to design a Photography Alphabet Book for children (and adults) where we can teach our kids the alphabet in both English and Spanish, while we also enjoy the beautiful Island of Culebra. ABC of Culebra is a photo book inspired by the Island of Culebra, composed of 52 photos showing the alphabet in English & Spanish. A Beautiful book for kids (and adults) to see and learn the alphabet while enjoying pictures of our Island. The ABC of Culebra was achieved thanks to the 381 people (BACKERS) who believed in the project and helped us make it a reality through a Kickstarter Campaign. 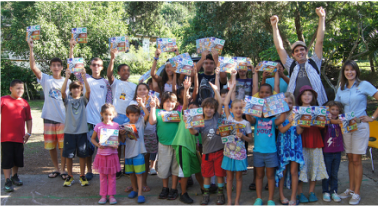 Part of our goal was to give a Book and a Puzzle to the children in Culebra. With the help of the backers and the effort of Vieques Air Link, Carlos Jeep Rental and Cape Air we achieve our goal giving over a 150 copies and puzzles. And if you share please give us credit we love you for that.